When you have little kids and are a stay-at-home mum it can be so hard to fit in any time for exercise. We might think we can still visit the gym, swimming, a yoga class or even home-style aerobics; but the reality is it doesn’t happen. The good news? You’re actually probably already exercising and don’t even know it! Here are 12 bits of accidental fitness you’re probably doing every day. If supermarket shopping for an hour can burn around 350 calories, imagine how much fitter you’ll get when you have multiple kids all piled in on top of the groceries? Manoeuvring around the car park is also particularly challenging in this instance, requiring much controlled strength as you try and lug your load amidst a wonky wheel constantly throwing you off balance. Great for the arms in particular, who needs weights when you’ve got a full trolley? A lot of babies have colic or reflux and are very hard to settle as they often can’t be laid down for up to an hour after a feed. While this may seem like endless torture to the sleep deprived new mum, walking around holding or rocking your baby for long periods of time will definitely help you stay in shape as your legs are constantly moving and your arms are bearing the weight of your child. A great win when you feel like you’re spectacularly losing. Changing your little one’s nappy seems simple enough, but when they’re a bit older it becomes super tricky as they twist, turn, kick and attempt to run away (even if on a change table). Incredibly frustrating, just think about how great those twists are for your mummy tummy?! Each time you lunge to re-grab your child you’ll be targeting those troublesome obliques (side core muscles). Unless you have a garage with internal access, carrying a heavy nappy bag, multiple bags of groceries and your child into your house is going to be a regular thing. Usually you won’t have the option of doing several trips (as you can’t leave your baby alone), which means you’ve got to do it all in one go! You’ll exercise immense arm strength you didn’t even know you had. Sure online shopping might be easier, but is it going to give you lean guns? We don’t think so! Those baby car seats are darn heavy when there’s a child in it! Especially the more old-fashioned ones which are particularly clunky. So each time you remove it and carefully carry it inside (like a café or the house because you want your baby to stay sleeping), you have to awkwardly manage the bulky weight with one arm which really works your muscles. Just remember to swap hands occasionally so you work out both arms! Strapping a baby to your chest is wonderful for bonding, plus it leaves your hands free to get other stuff done. And the best part is, if you’re running around doing chores with that extra baby weight on you, you’re going to burn a whole lot more energy. Even simply walking up the stairs will require a lot more effort, which will pay off on your backside and legs. Brilliant! First you’ve got to fill up that heavy basket and carry it out to the line (arm strengthening right there). Then it’s time to bend and stretch, reach for the skies! Each time you get a piece of laundry and peg it up high you’re doing some great stretches, and you’re getting some nice fresh air to boot! Next time you groan at the thought of having to whip out the Hoover be cheered at the workout your core and whole body is going to get. By pushing the vacuum back and forth, you work the external obliques, transverse abdominis, rectus abdominal, diaphragm, trapezius, and the multifidus muscles. Estimated calories burned: 119 for 30 minutes. Kids leave stuff everywhere. 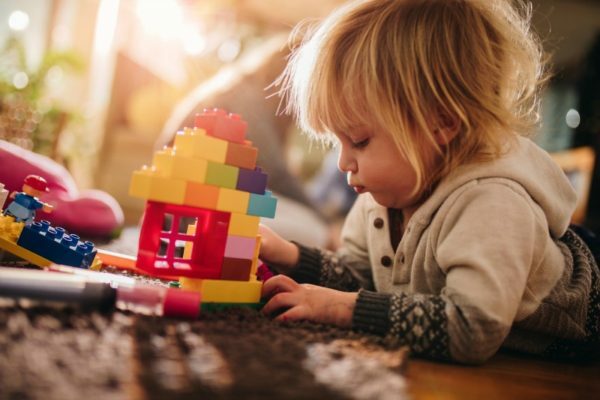 No sooner than you’ve picked up all the dozens of pieces of Lego off the floor, then it’s wooden blocks or something else that’s been left out, meaning you have to bend down or get on your knees once again to tidy it all up. Squatting and lunging is great for your backside and thighs though, so there is a silver lining behind all that mess! Nothing makes you move quicker than an escapee toddler who’s headed for danger. These sudden sprint bursts will elevate your heart rate nicely (well that’s a gentle way of putting it, sudden panic is more like it), but your body will feel the fat burning effects long after your little one is safely back in your arms (or strapped into a pram). It may seen tedious, but each time you lug that pram in and out of the boot you’re doing your arms a favour with some strength training – even more so if you have a double seater! The same goes for lifting up stairs, especially if your child is still in it, but be careful about safety for your bub and watch you don’t injure your back. Okay, so technically this isn’t exercise but breastfeeding does use up a lot of energy! In fact, it’s estimated that up to 500 calories a day can be burned simply by having a breast-fed baby – without even leaving the couch! Did we miss any? What are your favourite accidental mum exercises?